Dialogues with some of the most successful people in business are featured in this book. Conducted by Gretchen Morgenson, these interviews reveal the strategies, fears, philosophies, and ambitions that characterize each subject. Selected from a broad range of disciplines, the five individuals featured offer a full and varied picture of what it takes to prevail in today's business world. 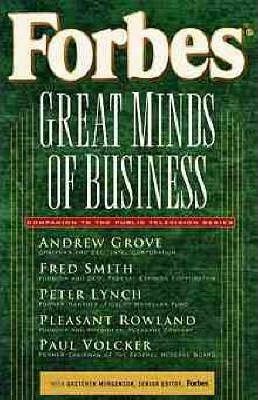 They include: Andrew Grove, the head of Intel; Pleasant Rowland, the founder of Pleasant Company and the American Girl Collection; Fred Smith, the founder of Federal Express, an entrepreneur who built a global success story; Peter Lynch, the former manager of Fidelity's Magellan Fund; and Paul Volcker, economist and former chairman of the Federal Reserve Board. ANDREW GROVE: the vibrant head of Intel -- the company whose microprocessors power 90% of the world's personal computers--is widely regarded as the best corporate manager in America. FRED SMITH: a shining example of entrepreneurship at its best, the founder of Federal Express Corporation built an entire industry from scratch, and has--more than any other entrepreneur in recent history--physically changed the way business is done. PETER LYNCH: during his 13 years at the helm of Fidelity's Magellan Fund, he outperformed the stock market averages at least fivefold, and masterfully turned Magellan into the nation's largest mutual fund. PLEASANT ROWLAND: with no experience in either marketing or the toy business, she founded Pleasant Company, an immensely profitable doll, clothing, and publishing empire that is now worth $250 million. PAUL VOLCKER: perhaps the most famous--and respected--chairman in the history of the Federal Reserve--America's central bank--he laid the groundwork for the biggest wealth-creating bull market the United States has ever known.